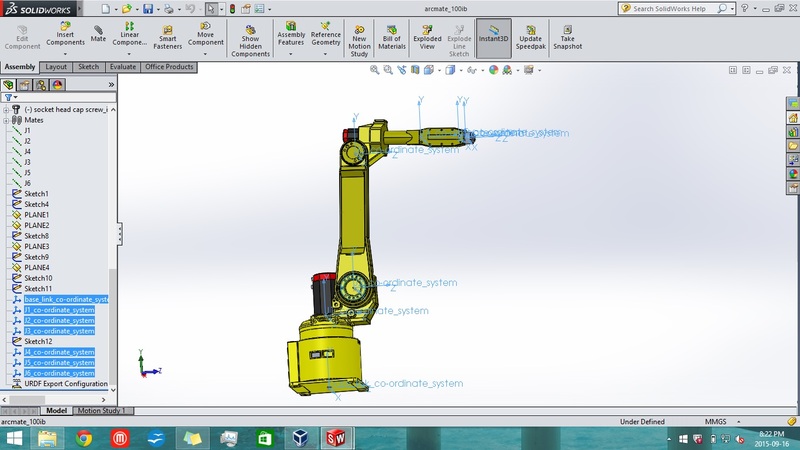 I've attached a few pictures highlighting my problem and what is going on is I setup my axis and co ordinate systems in solidworks according to the guides whereby the axis are along the joints of the robot and the co ordinate systems for each joint is along the axis. 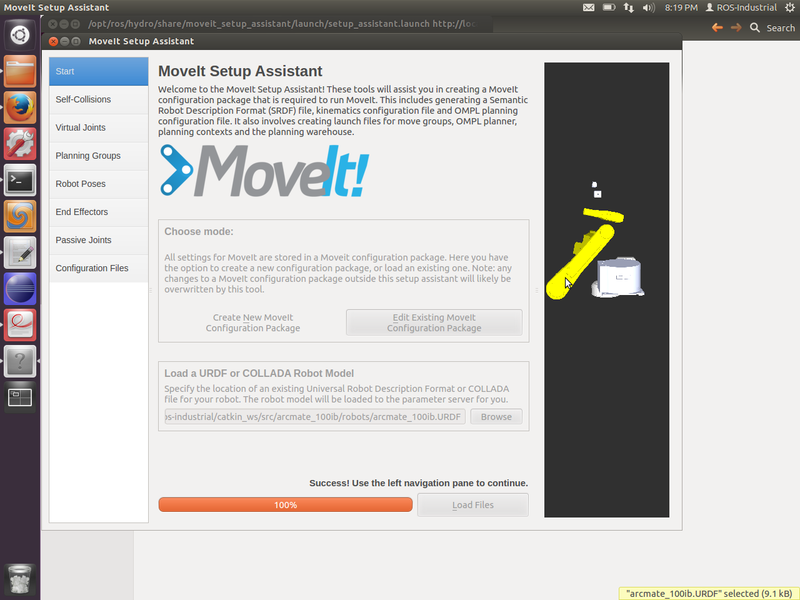 I export my URDF file from solidworks and when I create a moveit! package the joints are all misaligned and the motion is completely off. what I mean is the joints rotate at offset axis and the links are very far from one another. I've already varied the directions of the co ordinates but have seen the same results and I've managed to get the motion close to what it is supposed to be like but even so it's not what the motion should be like on the real robot. I can't upload the files because I'm a very new member but hopefully one of the members here can still offer some advice. Your images aren't visible. Could you upload them to imgur.com and add the links to your question? If you can make your urdf files available, that would also help (dropbox/github/wetransfer). As to the plugin: have you made it use your coordsys origins before exporting? Also: if you accept the answer to your previous question, you'll get some karma, which will unlock some of the features on this site. I'll take a look. In the meantime, you could perhaps use the recently added M-6iB from the ROS-Industrial Fanuc support packages (here). ARC Mate 100iB and M-6iB are identical as far as I know. This will result in a joint being defined between base_link and link_1 (what you'd want), which will be a revolute joint rotating around the -Y axis (probably not what you want). As the first axis of an ARC Mate 100iB rotates the manipulator over the robot's base, this needs to rotated around the (+)Z axis (third position in the xyz attribute). The other axis elements have (even) stranger values. J4: xyz="0 -0.067993 0.99769". While this is a valid axis definition, I'd expect a single 1 here, in the location for the X axis (so: xyz="1 0 0"). The M-6iB urdf I linked in my comment contains the correct axes definitions, perhaps you could use those as a guide. 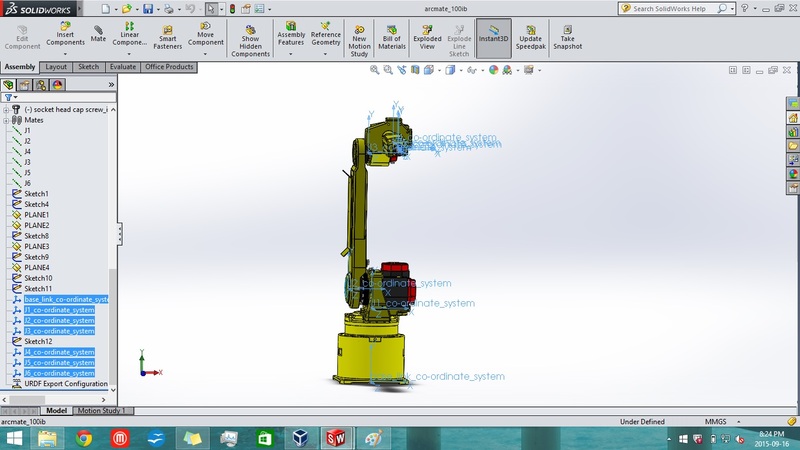 Your screenshots do show coordinate system origins in the SolidWorks assembly. Are you sure you selected those from the dropdown boxes in the 'URDF export wizard'? Also make sure they have the correct orientation (X forward, Y left, Z up). The SolidWorks to URDF exporter can be a bit difficult to work with, but if you place your reference geometry correctly, it should work. Ignoring the typo (-436 rad), this would still give J2 double its actual range. You'll want to make sure these match the actual specifications of the robot, otherwise MoveIt (fi) cannot plan properly for your robot. Just to be sure: I mentioned that there is M-6iB support in ROS-Industrial, which should be identical to the ARC Mate 100iB. We also have M-16iB/20 support, but that is not what I was referring to.